Well, it was a good week. Having some extra time off, I took the opportunity to catch up with friends, be social, have fun, etc. However, I was also happy when I had the chance to have a few quieter days to slow down and stay at home more. March 26: On Thursday night I had dinner with a friend, and we tried The Open Kitchen. Although they had a $12 steak special that was very tempting, I knew there was no way I was going to eat a 14 ounce steak. So I opted for a California Chicken Salad. Yeah, there was no way I was going to eat all of this at once either! It reminded me of the salads I would get at a restaurant in Staten Island, except there they would have twice as much chicken on them. People may wonder why I would order just a salad when I eat out, but salad veggies and lean protein is usually a tummy friendly option for me. 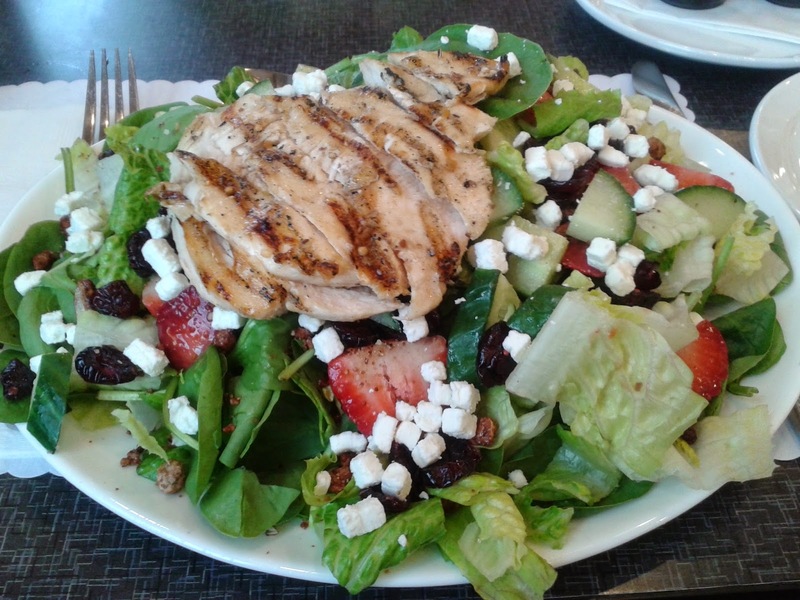 This one had romaine lettuce, spinach, cucumber, strawberries, candied pecans, dried cranberries and goat cheese. This was my first try at goat cheese. It's softer than I like most of my cheeses and has a more sour taste, so it's not a new favourite. Although I want to brave blue cheese yet and try goat milk. I've tried many milk alternatives (rice, soy, almond, and coconut), but not any other animal sourced alternatives. From there, we went to a prayer meeting with a small group of believers I hadn't met, and it was a blessing to meet with them. It was here I also heard about antinomianism. I'm not one to delve deeply into theology and although I'm familiar with some ideas, this was new. According to the dictionary, an antinomian is "one who holds that under the gospel dispensation of grace the moral law is of no use or obligation because faith alone is necessary to salvation." I would be interested in learning more about this idea, even if I don't agree with it. March 27: Friday was a see what happens kind of day where I didn't really plan anything. I was reading a local magazine publication and learned a little about DMQ (Difference Making Quotient), but I never did figure out how you measure a person's DMQ. I tried a Salted Caramel timbit, which was tasty. I set out to explore some different educational options I had found out about in the previous 24 hours, ways that I could grow in my administrative and writing skills, or take Bible school type courses, without making a big commitment. I was definitely very interested in The Silo Project and hope that later this year I can work through some of their courses. I also learned that in Hawaii, after the Pearl Harbour invasion, the state was concerned about another Japanese invasion and what would happen if the Japanese stole cash and used it to fund their war effort. So the state recalled all the bills, with small allowances, and printed new ones, so that if money was stolen, people could see it came from Hawaii. Not knowing what to do with the $200 million recalled, and it being too expensive to ship the bills to the mainland, they burned them. March 28: Tom Ryan was the culinary scientist who invented the McDonald's McGriddle, stuffed crust pizza for Pizza Hut, and a lot of other fast foods. March 29: Sunday was a bit of an emotional day for me. It was a day of God bringing together the things I was thinking and praying about in the previous few days and revealed to me a purpose. I don't know yet what it will look like and exactly what He has in store, but it could get exciting. I also had another friend catch-up day. After bowling, which we discovered goes way too fast with just two people, we pondered what to do while we got hungry enough to have dinner. We set out to find the Jumbo monument, which I hadn't seen since I was a kid, knowing the general part of town. From there I followed signs and winding roads to see what Historic St. Thomas was all about, which reminded me of Staten Island. This exploring came in very useful the next day when I tried to get from one part of town to a place I had never been, with a few directions, an address and a general idea of where to go. After letting our appetites build, we settled on Bella Jack's which I had often wanted to try. The first unique item on the menu that caught my eye was a shrimp and pineapple quesadilla. I like shrimp, and I like Hawaiian pizza, but pineapple in a quesadilla? It was good, although they could have filled it a little more. All in all, a good afternoon catching up on life, which is what really mattered. March 30: I swam in the deep end! We kept it simple the first time, and I learned that once you cross that black line, it really does drop off far and I was hanging onto the wall to keep my head above water. I just swam across the pool on my back, without strokes, just to get used to it. My instructor stayed beside me, to make sure I didn't drown in case I panicked, but I actually remained quite calm and made it without any problems. Keep your chin back, stay calm, and keep kicking! I also made some significant improvements on my whip kick. The hardest part has been keeping my feet out, since I keep wanting to have ballerina toes or something. Thankfully I'm not a kid or my instructor would make me walk around the deck like a penguin! In the afternoon, I got a hair cut, and in addition to enjoying my bouncy curls again, I also got my hairdresser to wax my eyebrows for the first time! I have eyebrows that tend to want to take up more of my face than I like, and I was quite pleased with the end result! I didn't get as many tears as I expected. I mostly giggled. I don't know which is worse for the person having to do it! March 31: You know when you kind of know the meaning of something, or have an idea, but not really? Yep, Anne Shirley felt "unregenerate" around Mrs. Lynde and that set me searching. Also, the word "contrite" came up at Bible study, so I now have a decent understanding of that. How often do we read stuff in our Bibles and miss lots because we just don't understand the meaning of a word? April 1: And sometimes I like to know where days on our calendars or traditions associated with days came from. You know what else this means??!!!! I'm a quarter way through my year!!! I think there will be a great sense of relief when this year is over, but also a sense of satisfaction to look back and see what I accomplished. Anyhow, to my point! And this is no joke! It's April 1st. The first association between foolishness and the date is found in The Canterbury Tales by Geoffrey Chaucer. Other references and dates go back to the 1500s and 1600s. During the Middle Ages in Europe, people celebrated New Year's Day on March 25, and others over a long-weekend ending on April 1. There is also an April fish tradition (poissons d'avril) that French-speaking people have of trying to attach a paper fish to a person's back unnoticed. Hmm, this gives me ideas! Labels: food, fun facts, What Did I Do?